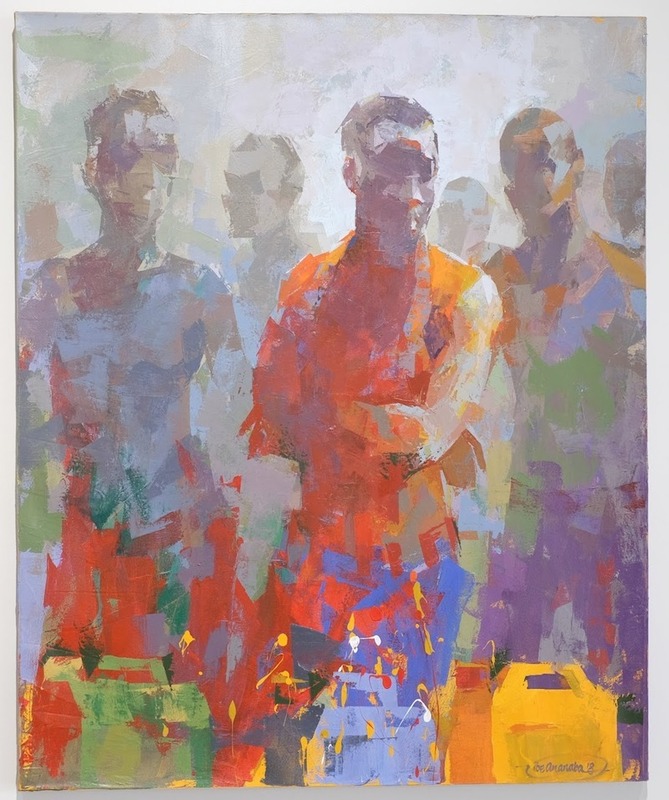 Ibe Ananaba, Give us this day our daily fuel (4), 2018, acrylic on canvas, 40 x 50''. Ibe Ananaba does not suffer metaphors. For his latest exhibition, “Long-Drawn Shadows,” Ananaba—who has explored fashion and the rise of social media—continues to document contemporary Nigerian culture. This show finds him working within a geopolitical framework, as he pays close attention to Nigeria’s problematic natural resource: oil. There are no doubts about his thoughts on the topic; the works’ titles and scenes leave little room for the viewer to interpret meaning outside what the artist has clearly intended. Watercolors of men and women in pensive, broody poses welcome the viewer. They belong to a series titled “In Search of a Better Tomorrow,” 2018. Farther into the cavernous gallery space, Ananaba lets his displeasures and grievances spill out onto larger canvases in contrasting hues. Here lie frustration and anger and the people who feel it, in blinding splashes of orange, red, and purple acrylic. The yellow jerry can becomes a motif. The object is, after all, a familiar accessory to most Nigerians who have endured an oil-rich but governance-poor state where being blessed by the world’s most sought-after product has not guaranteed any kind of collective wealth. These cans are a must in a country where endless fuel station queues are an annual occurrence. Ananaba paints the irony. Although a bearer of bad news, he often brings a delight to his canvases. Lagos dandies are rendered red-carpet ready, but even they aren’t above hustling for fuel. Below the paintings, Ananaba has lined around thirty jerry cans to form a still frame of lack. The gesture brings a cinematic quality to the works, one enhanced by the artist’s noisy colors and foamy brushstrokes. If you look at them long enough, you might expect the men and women—thinking, complaining, suffering—to walk off the walls and share their woes in voice.